We talked about how we’ve been noticing it moving in this direction for some time and that we can’t imagine how anything that comes from now on could be a “surprise” or a shock to us after all we’ve seen, how there seems to be nothing left to our imagination anymore because the greatest things we can think of are either already happening or just another result of what’s already going on. We talked about how kids don’t often play outside anymore or make their own fun or even know about classic children’s stories, songs and fairy tales, and about how going out to eat at a place like McDonalds was a real treat for kids but now they’re everywhere and people are driving through, eating on their way to somewhere else. We also agreed that this is one of the reasons we like “the store” so much: the people there think like we do about home and family, making and building things by hand, sharing moments that aren’t just about what you are making but why and what kind of fun you are having doing it. It’s a store with things and people that remind us of ways that we can take back some of what this crazy world has lost and in a way reclaim it for ourselves. We talked about how the world is a smaller place now and everyone can reach out and touch someone across the globe in a matter of hours because we have monstrous multi-level jets to fly us wherever we want to go. The things we saw in movies that made our chins drop are now really just around the corner. Many children will have seen more of the world by the time they’re ten years old than I will ever see, and a yearly or more often vacation to a tropical spot is becoming the norm for many families. While en route, the inflight movie is showing some other wonderful place you might want to visit next. We concluded that this isn’t necessarily a bad thing at all, just that it’s more expected than special or amazing. We talked about old shows like Buck Rogers, and how it was exciting back then to think that somehow, someday the world might actually look like that, but noticed that now there’s no more wonder in science fiction. Other than beaming up Scotty, the world of science and technology has pretty much done it all. They still don’t know for sure if there’s anyone else out there to beam us back, but even the alien movies can’t shock or amaze anymore, and we’re noticing that all the movies of today that we find to be really good, whether set in ancient, modern or futuristic times, are more about the human spirit and what makes the world good in the most basic sense than they are about imagining possibilities. They’re running out of ways to amaze us. The funny thing here – or perhaps the enlightening thing – is that “WE” were not myself and another middle-aged person sharing deep thoughts. This conversation was with my daughter who, at twenty-six, has realized that she’s already seen it all. Don’t get me wrong – I love my power tools, my computer and my mobile devices for the convenience they provide (and the memory, by way of a calendar that pops up reminders for me in my less-than-with-it moments) and I’m not knocking the TV, the modern household appliances or the indoor bathrooms. I like to be warm in winter and I don’t like chopping wood. 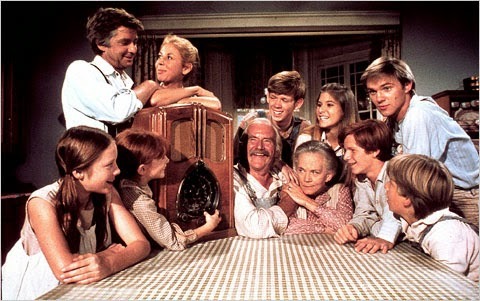 But when I watch favourite old programs like the Waltons and Road to Avonlea, something in me wants to be there, away from this fast-paced complicated world. I know they had their problems as do people in every era, but there’s something I envy in the idea of keeping all your money in a jar in the cupboard and not having to worry about paying for anything but food and clothing, because there were no light, heat, or water bills in the mail. I see the simplicity, with the house and furniture that dad built, the family time around the kitchen table where people talked and laughed, the after supper time at the old radio curled up in blankets mom made, and later the husband and wife time out on the front porch swing, and I just want to grab some of it. Life was filled with homemade goodness and it wasn’t just because they didn’t have the machines to take away the work; there was satisfaction and enjoyment in the making of things, in the making of a home. My mom taught me to sew my own clothes when I was nine years old and while I rarely sew anything now, that skill got me through many years of sewing things for myself, my husband, my kids, and our home, and if I need to sew I certainly can! It was the first of many crafts I learned along the way (whenever a new one came along, my mom would buy supplies and give them to me to learn to do it!) and while the hobbies have changed, the enjoyment of making things is always there. My mom still knits and quilts and has made sure that even her grandchildren have baby sweaters stashed away for when they have their own families. I am grateful for the homemade things we had growing up and that my mom passed on to me the skills and the desire to make things with my own hands. I honestly don’t intend to sound like the senior who constantly reminds young people about the olden days and how things were better then, because some things are better now. It’s just that once something good comes along it seems to go so far that we lose the “something good” that we had before. There are many good things about modern life, and I’m happy to take advantage of those that interest me. But I don’t really know if they make the world a better place or just a different one. I do know now that making and building things myself has given me a sense of taking back something that’s been lost, reclaiming something from a simpler time and making it happen here and now for me. I know that next time there are little boys riding their bikes through the ditch along our backyard I will be thankful for the reminder that some kids do still play outside and make their own fun. And I know that I’m glad my daughter is adamant that her children will learn about fairy tales.